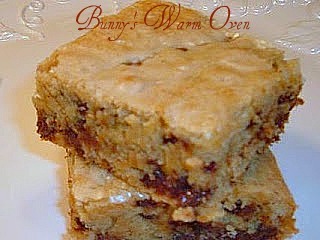 My very good friend Bev posted this recipe on a forum that Bev and I belong to. She got the recipe from the Reese Peanut Butter recipe site. Ohhhh is this good! To Read More, Click On The Recipe Title. Your not going to believe how easy and fast this is to make. It’s all done in one…….pot!! After you melt the butter and add the peanut butter all the other ingredients go into the pot! Make sure your using a 4 quart pan though so everything fits in there without a problem. I adapted it this time and used both milk chocolate chips and mini semi sweet chips. I was emptying the cabinets of all the 1/2 bags of chips I had. This is a very moist brownie, I get raves when I make this! Preheat oven to 350. Grease 13 x 9 x 2 baking pan . Melt butter in 4 quart pot , after after the butter is melted take the pot off of the heat. Add peanut butter, stir until melted. Stir in sugar and vanilla. Add eggs with spoon, stir until well blended Add four, baking powder and salt, stir until blended. Stir in chocolate chips. Spread in prepared pan bake 35 minutes or until top is golden. Previous Post: « Foodie Blog Roll Member !! I could go for one of these right now! Add a nice cold glass of milk and I’d be in heaven. That looks decadent! Sending this one to the printer right away!! Thank you for sharing! Bunny, yay, I found it! I’ve already printed it out & am going to make these tonight! Thanks for telling me about them.